The ability to use lighter or heavier projectiles for different applications in a caliber has led to heavy-and-slow versus light-and-fast debates ad nauseum ever since people realized that they had options. Cavemen probably thought about it too, but then they were just like, “Nah, hitting target more important.” Barnes’ 95 grain TAC-XP bullet won’t be an exception to that rule. But it could well make some people rethink their positions on the age-old question. Why? This 95 grain bullet has 147 grain horsepower. 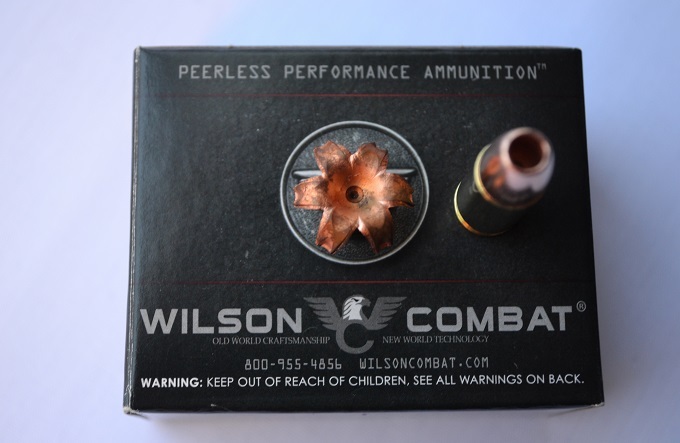 Wilson Combat has loaded Barnes’ 95 grain solid-copper Tac-XP bullet at an advertised velocity of 1300 fps out of a 4″ barrel. As usual, their product lived up to the advertising claims. Our chrono results were 1304 out of a Glock 17 and slightly higher out of a 5″ Wilson 1911. While it’s true that there are +p+ 9mm loads out there in both the 95 and 115 grain variants that produce more energy (I’m a big fan of a 115 grain +p+ load that pushes that bullet around 1300 fps as well), I chose to test this load from Wilson Combat because in my opinion the main reason to select a lighter projectile at higher velocity is to reduce the amount of muzzle flip and felt recoil, which this load does a great job with. I also have concerns that this particular bullet might actually OVER-expand at the velocities some of those +p+ loads push such a light bullet (read: 95 gr pushed to ~1500 fps) to the extent that it could actually reduce terminal effectiveness. So while I also like the 115 grain Barnes bullet at about 1300, I feel that the 95 grain at the same speed offers a lot to people who (1) do not want to run +p+ pressures in their guns or (2) don’t like the additional muzzle flip that goes with the territory but do appreciate higher velocity offerings for any number of reasons. Add to that the fact that shots on target with this stuff feel like match loads and you really have a winner. 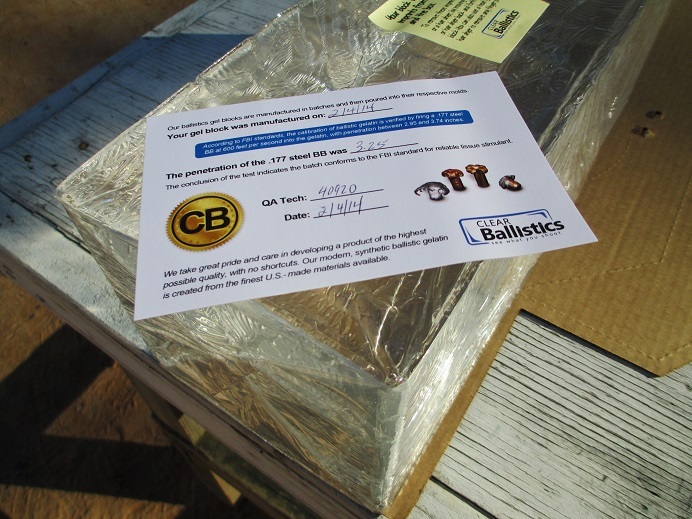 Clear Ballistics is another company that has set the bar in their area of expertise, much as Wilson has done in the realm of 1911s, magazines, and now ammunition. Their ballistic gel is calibrated to meet FBI specs out of the box without degrading over time or having to be maintained in a narrow temperature range. Furthermore, it actually is clear, as the name suggests, so you can see the path of the rounds throughout your testing procedures regardless of which part of the block you shoot. It makes it much easier to measure, and you can see so much better than traditional gel blocks that it really is worth emphasizing. It can also be melted and re-poured up to 10 times if you want to re-use it. So when we decided to start some ballistics testing, we knew the gel we wanted to use. And we owe Clear Ballistics bigtime thanks for helping us get onto industry pricing for purposes of doing a lot more gel reviews in the future! 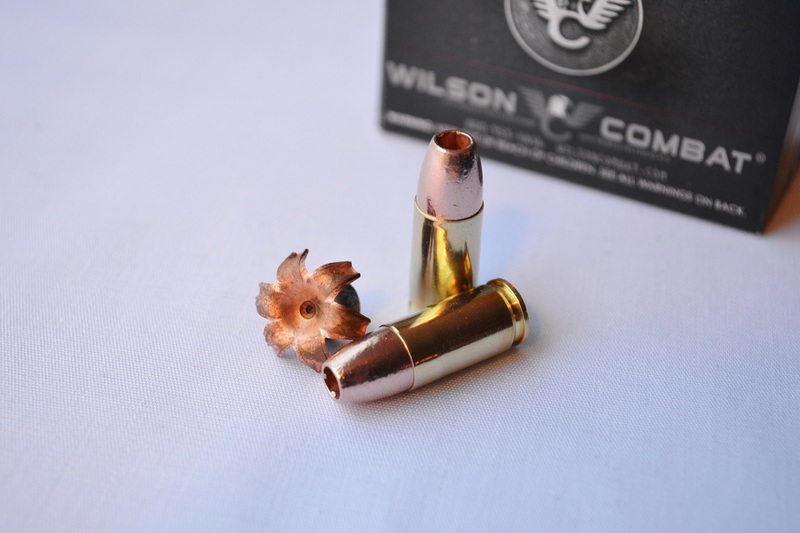 (top) The Wilson 95 grain Barnes Tac-XP load penetrated 13.6″ in a Clear Ballistics 10% FBI gel block. 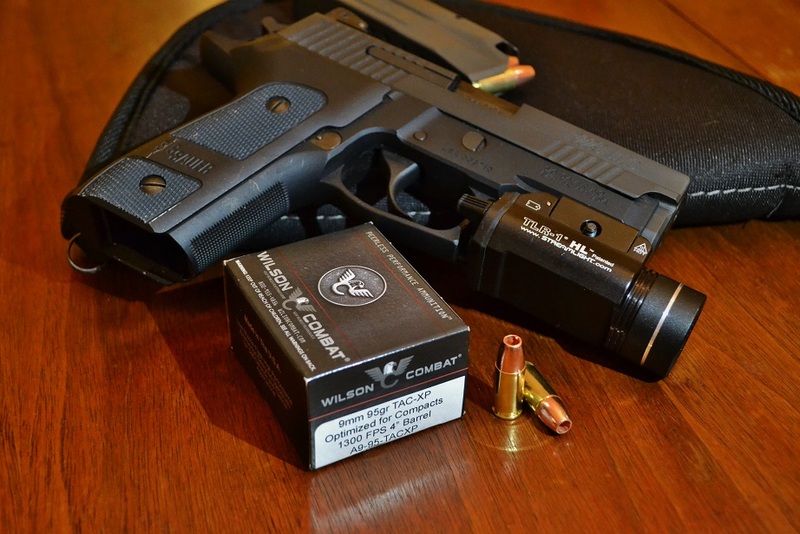 On the range, Wilson Combat’s 95 grain 9mm load did not disappoint. It fell squarely within the FBI’s 12-18″ penetration range and reached a depth of approximately 13.6″. Moreover, it mushroomed into a nearly perfect six-petaled flower that measured right around 11/16 of an inch. That’s .6875″, which is highly impressive considering the bullet’s pre-expanded diameter was .355-.356″. 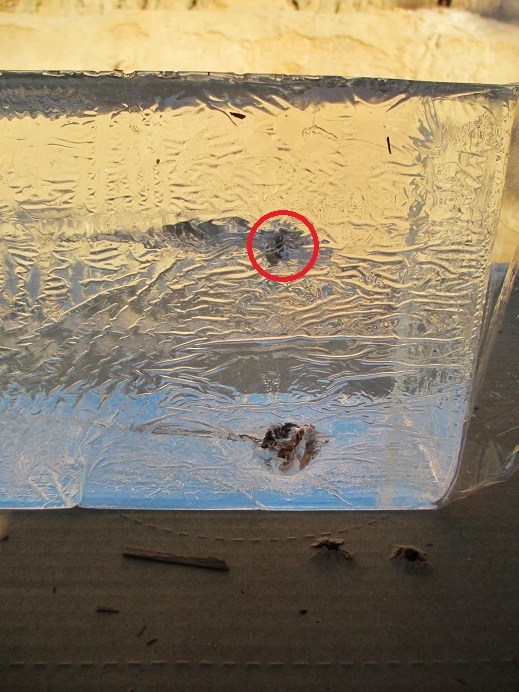 It nearly doubled in size after hitting ballistic gel designed to mimic the density of human tissue. Bear in mind that while some 124 and 147 grain bullets (particularly Winchester’s T-Series and Federal’s HST, not to mention other loads utilizing Barnes’ own 115 grain Tac-XP bullet) are perfectly capable of expanding to twice their initial diameter, this bullet weighs only 95 grains, which means it’s shorter than the others. And that makes this type of performance even more impressive. If you’re looking for high-velocity performance without +p+ pressures or muzzle flip, this load needs to be on your radar. It has all the oomph it needs to stop bad guys in their tracks without affecting the ability of shooters with smaller hands or wrists to get multiple shots on target quickly. The solid copper construction of the Barnes bullet results in 100% weight retention through just about any barrier, which translates to more energy being retained as it pushes its way through the target. And the impressive expansion means that the energy is going to be dumped in the target that the bullet hits instead of something else on the other side. If you’re trying to stop a threat, that’s the kind of performance you want. And if you’re trying to stop a threat and there might be a loved one on the other side of the wall, it’s the kind of performance you need. Great review Colt. I think you just convinced me to run some of these babies through my Sig P938. I will stick with HST 147s in my BrigTac. Can’t blame you there, Jim. I think this would be a FANTASTIC load through compacts. Still tough to beat the 147 grain HST with anything but the 115 gr Barnes bullet, though. IMO those are the best two projectiles in 9mm at the moment. Wasn’t impressed enough with the Gold Dot G2 to switch what I’m carrying in anything, but we’ll have those results up shortly as well. I love the Barnes TSX in carbines. like Black Hills 50gr TSX. you can have 3000+FPS out of a 14.5 barrel. But for some reason I`m sticking with JHP bullets for pistol /revolver. There are still some fantastic JHPs out there (HST, Ranger-T, etc. ), but particularly if you hunt with revolvers there are some very nice revolver loads out there that use Barnes bullets.